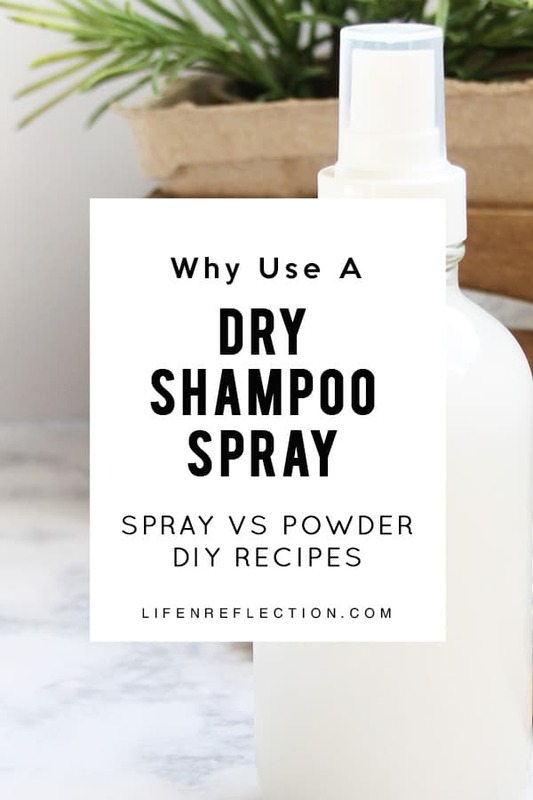 Why Use a DIY Dry Shampoo Spray? For starters, washing hair daily is not recommend or necessary for most hair types. Over-washing can strip your hair of natural healthy oils. And commercial chemical based shampoos often dry out hair leading to breakage and dead ends. Alternating with dry shampoo instead of washing hair helps to keep your hair and scalp moisturized. This post contains some affiliate links for your convenience, read the full disclosure policy. How does a Dry Shampoo Spray Work? 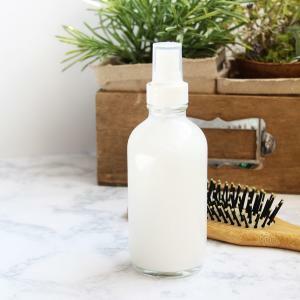 Applying a natural oil absorbing ingredient like baking soda or arrowroot powder to oily hair roots absorbs excess oil without harsh chemicals. A DIY dry shampoo spray is the perfect solution to use when you oversleep and don’t have time to wash your hair. 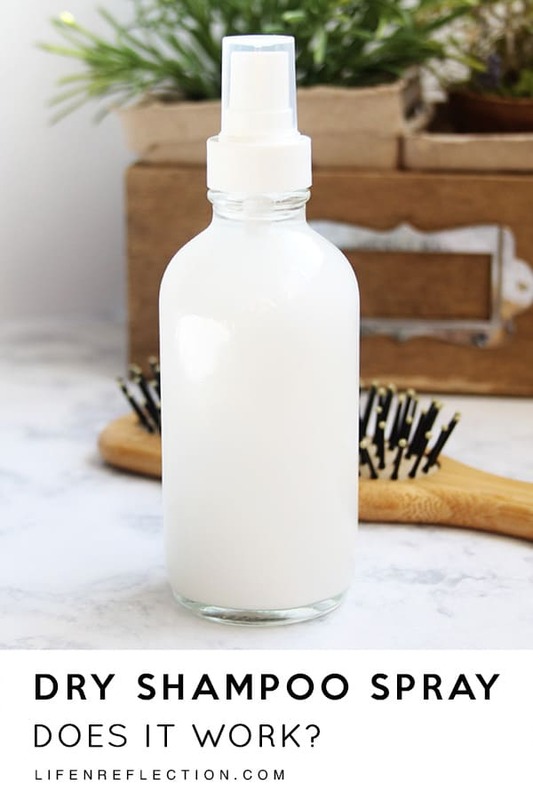 While you can apply oil absorbing arrowroot powder or baking soda directly to hair with a makeup brush, I find it much easier to use as a spray. The dry shampoo powder can be very messy to use. And you try to apply it after getting dressed for the day, look out for residue on your clothes! 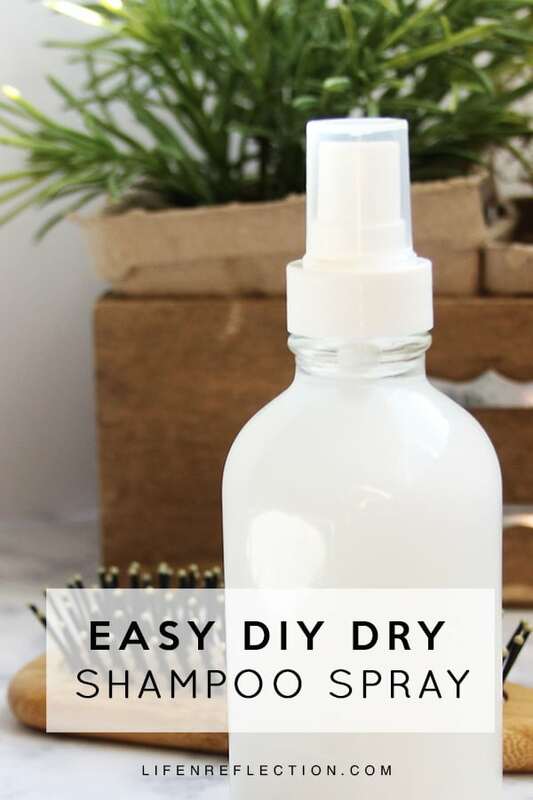 This recipe for a DIY dry shampoo spray is easy to apply, doesn’t create a mess, and is quick to make! Related: Is Your Natural Hair Conditioner Really Doing Its Job? 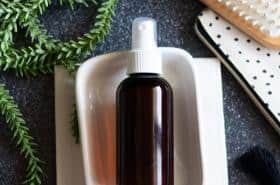 What are the Best Essential Oils to use in a DIY Dry Shampoo Spray? A member of the mint family, rosemary is a rather good-sized herb, similar to a woody bush and native to the Mediterranean area. This invigorating essential oil encourages blood flow to the scalp and stimulates hair follicles. Rosemary essential oil is a common ingredient used for anti-flake, premature graying, and thinning hair. 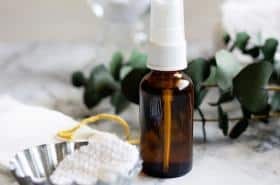 It is one of the best essentials oils to use in a dry shampoo because it works to balance the production of the sebum glands and clear clogged pores that can cause acne or an itchy scalp. Rosemary essential oil is packed full of antioxidants and regular application helps to ensure healthy, dandruff free, non-greasy hair! Extracted from the flowers of the herb, lavender essential oil can be used for all hair types. It is a mild, soothing essential oil used to improve blood circulation in the scalp, helps prevent hair loss, and promote hair growth. Similar to rosemary, lavender helps to balance sebum production, while maintaining a moisturized scalp. Lavender’s cleansing properties are helpful for controlling flakes and breakouts occurring on the scalp or hairline as well. All of which makes a great addition to a natural DIY dry shampoo spray. 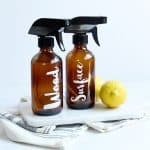 Using a funnel pour ½ cup distilled water into in a fine mist spray bottle (this is similar to the bottle I use). Add two tablespoons of arrowroot powder and vodka. 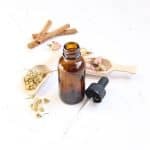 Remove the funnel and add 2 drops of rosemary essential oil and 3 drops of lavender essential oil. Place the fine mist nozzle on the spray bottle with the cap closed and shake well to combine. Shake well before each use. Hold a small section of hair up, pulling away from the scalp. Spray dry shampoo on the roots of the hair. Repeat until you’ve covered the oil areas. Then, either use your fingers to comb through roots or a natural boar hair brush which has fine bristles to distribute evenly. 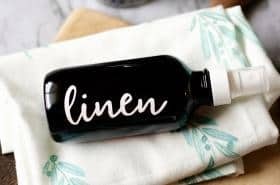 This DIY dry shampoo spray dries quicker than most I have tried due to the vodka, but you can speed things up if needed by blow drying. Either way, after drying style as usual. Is it better to use dry shampoo at night or in the morning? 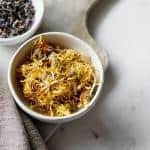 If you enjoy making things for yourself too check out one of my best-selling books Nourishing Nature: Beauty Recipes from the Garden and join the beginners’ natural bath and body course! I love to use natural DIY dry shampoo spray in between shampooing or after a workout. Not only does it keep my hair looking fresh, but the combination of rosemary and lavender also makes it smell amazing! Give it a try and I’m sure you’ll love it too!! I have made this and today I tried it for the first time.. it’s amazing it really works it also made my hair look so much thicker where I have so much hair loss,thank you again Kristy !! Yay, glad to hear that Debbie. I used it today too, it definitely helps make your hair look fuller instead of the “flat head” look many of us get on day two or three. Looking forward to trying this, but have a question – is the vodka a “must” for this DIY? I don’t drink so don’t have any on hand – I guess I could pick up a small pint if necessary, but wanted to check first. 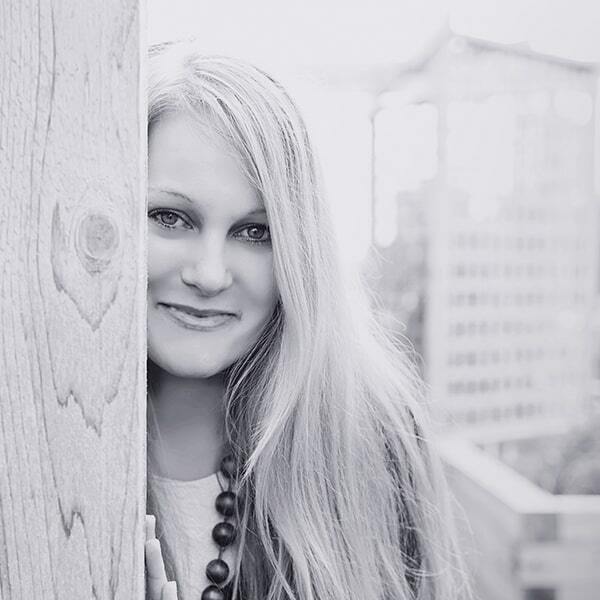 Thanks so much – enjoying your site!! Dana, I understand you could opt for a dry shampoo powder or swap the vodka for isopropyl alcohol.